Our forum member Jaylock first awakened me to the benefits of the Chaga mushroom. I bought some, and I have continued to research this well-documented natural health-enhancer. “Chaga mushroom extract inhibits oxidative DNA damage in lymphocytes of patients with inflammatory bowel disease. Here’s where Jaylock and I ordered ours. “After you have used the grounds enough times, you can then put the grounds into a jar with vodka and allow it to sit for 2 weeks in a dark place. The alcohol breaks down the waxy membrane around some of the Chaga cells and it releases even more of its nutrients. Remove the grinds from the Vodka and make another tea with them. This sounded like fun to me, so I’m making some Chaga extract. My extract contains a little sassafras and ginger, since I had already added these to my original Chaga tea. P.S. By the end of the day, my Chaga extract is already a lovely warm pink color. Oh, look! A 2015 scientific study on Chaga mushroom ethanol extract. I use Everclear grain alcohol. (Close enough.). The extract is “antioxidant, anti-viral, anti-inflammatory, hepatoprotective, platelet aggregation inhibitory, and anti-tumor”. Wow! Inonotus obliquus (I. obliquus), known as chaga mushroom, is a white rot fungus . I. obliquus can be made into tea decoctions, extracts, syrup, injections, hip bath agent, and aerosol and has been used as a folk medicine for treating cancer in many areas such as Russia, Asia, and North America [2,3]. 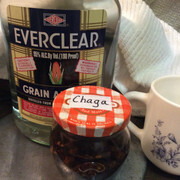 I was about to drink some apple juice, when I thought of ‘spiking’ it with my Chaga Extract. Remember that my Chaga extract also has a little sassafras and a little ginger root. Well, let me tell you! A half shot of Chaga Extract in my cup of apple juice was delicious. And I could even taste the hint of those extra herbs,...sort of a cross between a spiced apple and a vacation umbrella drink. P.S. And stops cancer, too! Innotus obliquus = Chaga mushroom.